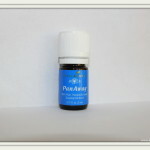 I have shared a general overview about essential oils as well as a post about essential oils for fertility. I am very passionate about sharing about eating a clean diet and living free of chemicals and medications, which is one of the reasons I love essential oils so much. I wish someone had shared this information with me loooong ago, so in hopes of bringing awareness to the natural approach to health, I want to continue to post on the topic of essential oils. Since it’s nearing flu season, I wanted to share some natural ways to stay healthy. My all time favorite oil for preventing sickness is thieves. 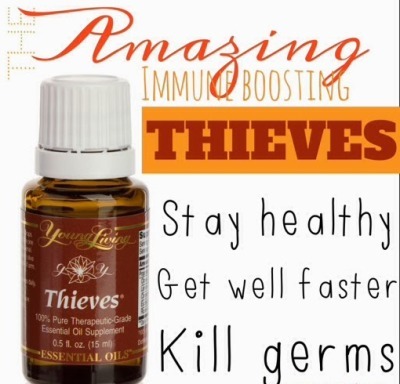 Thieves is a great oil to start with as it comes in the starter pack. Thieves is a blend oil, meaning it is made up of more than one oil. It includes very highly antibacterial, antiviral, and antifungal oils including clove, lemon, cinnamon, and eucalyptus. According to research at Weber State University, Thieves Oil was found to have a 99.6% kill rate against airborne bacteria when diffused, so it’s great not only to protect against sickness, but you can use it to make antibacterial lotions and soaps as well. To prevent sickness apply 1-2 drops on the feet daily. Thieves can be diffused as well. Flu and/or Cold – Apply RC and Raven to feet, chest, and back. Runny Nose – Apply RC and Raven to throat, temples, and sinus area. Sore Throat – Apply Purification and Oregano to throat. Gargle a drop of thieves. Allergies – Apply Lavender and Peppermint to base of neck. Can also digest using capsule. If you have any questions about essential oils or don’t know where to start, I would love to share more information! I receive a wholesale discount on all orders I place so if anyone wants to use my discount, please contact me. I am very passionate about using oils and want to share the same passion with others! I am not a medical doctor. The opinions expressed reflect my personal experiences and my personal opinions. The information and statements on this website are intended for educational purposes only and have not been evaluated by the Food and Drug Administration. Please seek the advice of a qualified health care provider if you have a serious health concern. I’ve tried Eos for other things but never these. I’ll have to get some soon I love natural remedies. I’m really sick right now. I have got to investigate this thieves oil. Is it only available through Young Living? I’ve investigated Young Living before but the shipping/duty to Canada makes it extraordinarily expensive. Thanks for these tips. I have some of these basic oils to try as well. I love Essential Oils! I haven’t tried Raven or RC yet, I need to stock up! Thieves everything when I am sick though for sure! That’t neat it can do so much! I use doterra, and I am pretty sure this is equivalent to our On Guard blend. I love EO’s 🙂 Love them! My bestie and I were just discussing this and the doTerra On Guard this week! I hate to admit that I have the entire starter pack and haven’t really used any of them much. Maybe I need to try this approach instead of the OTC drugs I always turn to. What would you recommend using for sleep issues? Todd and I both suffer from sleep problems. Love this info! I’ve been using some of the oils for fertility, i will definitely give some of these a try when the inevitable cold comes! Love this and love thieves 🙂 Thanks for sharing! 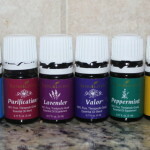 I am a huge fan of essential oils, however, you have enlightened me even more about the other oils I can use for colds, especially since the winter months are coming. Thanks for sharing on the #SHINEbloghop this week! Great info! I’ve been diffusing my Thieves and putting it on my feet lately. I need more Purification though…I’m out. I have been holding on to this post, so I could read it thoroughly when I had time! Thank you so much for sharing your heart and passion for this. I can’t wait until we can sign up and start ordering these…it shouldn’t be too much longer, Lord willing! This one sounds great as well!! 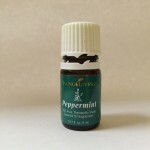 I can tell a lot of people like and use this oil and rhe Peppermint = Popular!